Zoology and Conservation graduate Tom Cockbill, originally from Walsall, West Midlands, recently established Wild Elements, a social enterprise based in Bangor, thanks to support from Bangor University’s Careers Service. Having already gained a BSc in Zoology and Conservation, an MA in Countryside Management and a PGCE Secondary Science (Biology) degree, combining these environmental and teaching knowledge seemed a natural progression. Tom took advantage of the free one-to-one business mentoring sessions available through B-Enterprising at Bangor University. The sessions were funded by the Welsh Government through the Youth Entrepreneurship strategy. When asked how the idea came about, Tom, who now lives in Bangor, said: “Wild Elements started with an initial chat with friends and colleagues whilst at Penrhyn Castle and Treborth Botanic Garden. I then had some great support and mentoring advice from Tim Ashcroft through B-Enterprising which really helped me get to grips with the minefield of business start-up. I subsequently got in touch with Greenhouse in Bangor who are committed to encouraging the growth of a sustainable local economy and who gave me access to affordable office space. “The overall aim of the venture is to provide accessible, fun and rewarding outdoor experiences across north Wales and promote the development of the individual’s self-confidence, self-esteem and wellbeing. Wild Elements collaborates with a broad range of partners including North Wales Wildlife Trust, Treborth Botanic Garden, Mantell Gwynedd and Gwynedd Youth Service to name but a few. Several Bangor students work as volunteers with Wild Elements and the company offers a volunteer intern programme for a year placement with SENRGY. There are a broad range of activities on offer – the company has successfully managed and completed several project from school-wide Forest School programmes and community events. 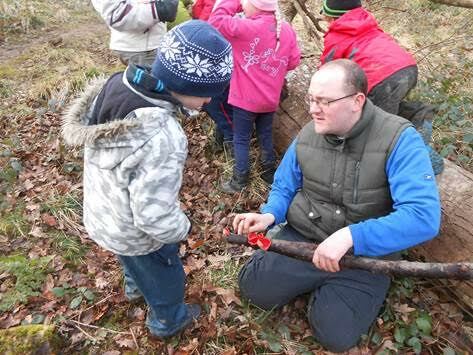 They are also able to provide low cost play schemes to get children out in the woods to build dens, cook on a fire, work with tools such as knives and axes and have fun with archery. Tom added: “I really enjoy the work I do. I can see the difference it makes to people and I get a ‘this feels right’ feeling. It’s not a 9 to 5 job which can mean much longer hours but it’s worth all the effort. I try not to get carried away with the idea of just sticking to what I’m good at, as opportunities may arise which involve adapting to what others want from the organisation. “My advice to anyone wanting to set up their own business or venture would be to make sure you take advantage of all the free services available and be clear about what it is that will make your business a success. There can be pitfalls too, you need to make sure you know which organisations you are legally obliged to join, such as the Information Commissioner for data protection for example, if you are going to be holding personal data about clients.